Three new limited colorways of the Air Jordan 1 Low are available now. A part of the "City Pack" the Air Jordan 1 Retro Low comes in colorways inspired by three of the most famous cities in the United States, Chicago, Los Angeles and New York. In honor of Memorial Day in the US on Monday, May 26th, Jordan Brand released these three limited edition versions at select accounts worldwide. First up is the "Los Angeles" edition. This pair comes in a white, kumquat, dark powder blue and light bone colorway. Featuring a white canvas and light bone suede upper with kumquat orange accents and a dark powder blue outsole with the "LA" city flag on the tongue tags. Second is the "Chicago" edition. This pair comes in a wolf grey, gym red, metallic silver and black colorway. Featuring a grey nubuck and silver anodized upper with red and black accents finished off by the "Chicago" city flag on the tongue tags. Third is the "New York" edition. This pair comes in a pro green, venom green, anthracite and black colorway. Featuring a pro green based leather upper with a unique graphic throughout along with black nylon found on the toe box and side panels, a venom green Swoosh on the sides and the "New York" city flag on the tongue tags. 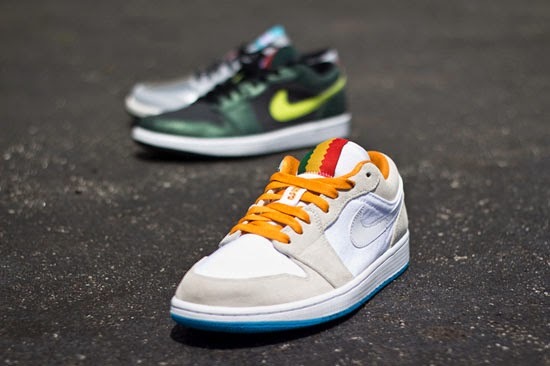 This Air Jordan 1 Low "City" Pack was a limited QS release. They are available now at select Jordan Brand accounts worldwide retailing for, $95. 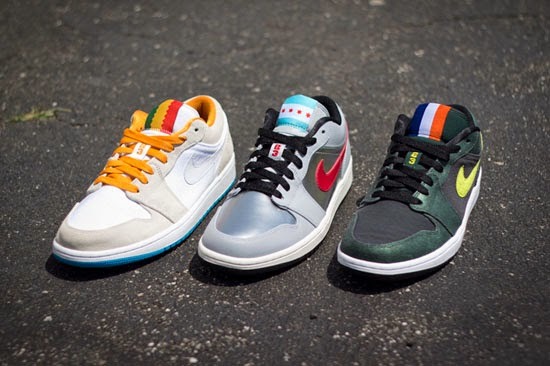 Enjoy the images below of the "City Pack" Air Jordan 1 Low featuring the "Los Angeles" edition in white, kumquat, dark powder blue and light bone, the "Chicago" edition in wolf grey, gym red, metallic silver and black and, the "New York" edition in pro green, venom green, anthracite and black. If you're interested in picking any of these up, check in with your local spots to see if they received them. Those of you looking for a pair now can, grab them from eBay here.